The heavyweight division attracts more attention than the lower weights and certainly brings its own brand of excitement to ring center. There is nothing quite like the electricity that takes place in an arena when two big named heavyweights meet. The idea of big men going at it in a fight that can end at any moment has no competition in all of sports. Here is my list as a boxing historian of the 10 greatest heavyweight fights of all time based on action, drama, and sustained fighting. 1. Muhammad Ali vs. Joe Frazier 3, Oct 1, 1975 Manila, Phillipines. Result: Ali TKO 14. A titanic struggle that the Oct 13, 1975 Sports Illustrated called "a drama in 3 acts: 1) Ali 2) Frazier 3) Ali." Muhammad Ali prevailed in the greatest fight of the greatest heavyweight trilogy of all time. Ali dominated the early rounds with furious jabs and speed of hand and foot. Frazier started "smoking" in the middle rounds and gave Ali such a terrible beating to the body that Ali later said, "it was the closest thing to death" that he ever had experienced. Sports Illustrated reported, "Ali slumped into his corner at the end of the 10th round exhausted and contemplated quitting." The 11th round was no better for the champion. Writer Mark Kram reported, "Ali got trapped in Frazier’s corner and blow after blow bit at his melting face, and specks of spittle flew from his mouth." "Lawd have mercy! ", Bundini shrieked as Ali took a terrible beating against the ropes. Ali went to the well and found deep inside himslef, a reservoir of will and determination that allowed him to come back like a true champion. Ali came out of his corner for the 12th and began to turn the fight around. Frazier's eyes began to swell shut from Ali's quick handed straight punching and combinations. By the 13 round Ali was hitting Frazier almost at will. After further punishment in the 14th Frazier's trainer Eddie Futch would not allow Joe to come out for the 15th. Ali had retained his title. This fight proved that Ali was no mere showman or a "fake" as one veteran observor once called him, but that he was indeed an all time great fighter. After the fight Frazier echoed this fact, "Lawdy, Lawdy his a great and mighty champion. I hit him with punches that would have brought down the walls of a city." 2. Jack Dempsey vs Luis Firpo. Sept. 24, 1923 Polo Grounds. Result: Dempsey KO 2. Eleven knockdowns in 3:57!!!! Few fights could match the drama and excitement of this one. At the opening bell a charging rhino named Luis Firpo rushed at Dempsey with one purpose to pound his man out of the ring! Firpo smashed Dempsey with a powering right to the jaw that buckled the champions knees! Dempsey was stunned and forced to clinch. The champion then retaliated with a flurry of savage blows that dropped Firpo to the canvas. He arose but a classic Dempsey combination -devastating right to the heart and a crushing left hook to the jaw -put Firpo down again. After a third consecutive knockdown Firpo was on his back rolling around and barely beat the count. In a modern ring the fight probabably would have been stoped at this point. Dempsey, a murderous puncher, kept up the assault dropping his man five times by the middle of round one! Suddenly, the "Wild Bull of the Pampas" was back in the fight. A wild, but dangerous roundhouse right found its mark on Dempsey's jaw. Dempsey's touches the canvas for a quick one count. The crowd was on its feet screaming. Firpo moved in to finish the wounded champion, but he left himself open as he did, and Dempsey unleashed a terrific, perhaps desperate, counter shot. Firpo was down again. After the 8th knockdown of Firpo in the opening round Luis rose from the canvas and fired a cannon like right to the jaw that knocked Dempsey clear through the ropes and out of the ring!! Jack landed upon the stunned laps of the ringside reporters who literally shoved him back into the ring. Though still groggy Dempsey floored the bewildered Firpo with a crushing right to the head. Amazingly Firpo rose from the canvas yet again. The bell ended futher assaults by either man. It was the end of the most thrilling round in heavyweight history. As Dempsey recovered between rounds he asked Kearns "what round was I knocked out." Kearns told him, "The fight is still on now get in there." In the second round Firpo again attacked the champion hoping to catch him with another wild swing. This time Dempsey was ready for him. Dempsey bobbed and weaved, slipping and blocking his opponents amateurish punches. Dempsey seizing an opening ripped home a sizzling uppercut that violently snapped Firpos head back. Firpo was down again, blood was spewing from his mouth and he was twitching horrifically on the canvas. Somehow, this courageous challenger once again struggled to his feet. Mercilessly, Jack Dempsey, moved in for the kill. Another pulverizing right lifted the bigger and stronger man off the canvas. Timber! It was all over. Luis Firpo was counted out in the most action packed heavyweight slugfest of all time. 3. Joe Jeannette vs Sam McVey, April 17 1909. Paris, France. Result: Jeannette TKO 49. Just because the film doesn't exist doesnt mean it wasnt one of the greatest heavyweight fights ever. Jeannette was floored 27 times and McVey 7 times in a fight to the finish! Sam McVey floored Joe Jeannette 21 times in the first 19 rounds. After the 17th round bell Jeanette had to be dragged to his corner. In modern times there is no way such a fight would have been allowed to continue. We would never allow anyone to take that kind of a beating. McVey would have won by devastating TKO and it would have been hailed in heavyweight history as one of the most thorough and viscious one sided beatings ever delivered upon a top fighter. But this was a fight to the finish and until someone quit or was counted out they were allowed to continue. And there was certainly no quit in Joe Jeannette! Displaying heart, will and determination that nearly defies the imagination Jeannette kept getting up and refused to lose. McVey started to tire and slowed down from all the powerful punches he had thrown. In the 39th round Joe sent Sam to the canvas for the first time. McVey, exhausted couldnt answer the bell for the 50th round! Joe Jeannette despite suffering 27 knockdowns in this fight won by TKO! 4. Muhammad Ali vs. Joe Frazier 1. Mar 8, 1971. NY. Result: Frazier W 15. The most historically signicant of the Ali-Frazier trilogy. The first time 2 undefeated heavyweight champions ever fought for the title. It was billed simply as "The Fight". Ali's legs were not quite the same as the 60's version and he fought more flat-footed but perhaps hit a bit harder too. Ali didn't dance but his punches were fast and accurate and they landed far more frequently than did those of Frazier. Frazier's punches landed with more power as he worked the body consistently, fighting a good fight plan and making Ali pay for his mistakes. Ali's clowning cost him some close rounds but Frazier proved he deserved the decision when in the 11th round he nailed Ali with a tremendous lef hook that Bob waters wrote, had Ali's legs doing the "dance that puppets do when the guy with the strings is drunk." Frazier capped off his career defining performance with a knockdown in the 15th and final round. A crunching left hook thrown with all the power in Joe Fraziers body dropped Ali flat on is back. Ali was down! The cameras flashed a 1,000 times. Joe Frazier had just knocked out Muhammad Ali! Only he didn't. Ali was up at 4. It was the first time Ali ever proved he could take a heavy punch. Frazier was the winner by clear unanimous decision. 5. George Foreman vs. Ron Lyle. Jan 24, 1976. Las Vegas. Result: Foreman KO 5. A great heavyweight slugfest between two very hard punching heavyweights. Foreman was now the ex-champion having begun a comeback after losing his title to Muhammad Ali. Ron Lyle was a legit heavyweight contender having lost in a title shot to Ali the year before. 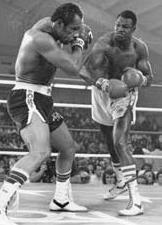 Shavers was coming off an impressive knockout victory against the also hard hitting top contender Earnie Shavers. The Forman-Lyle fight was perhaps the greatest heavyweight slugfest of the last half of the 20th century. "The guys were hitting the canvas left and right. It was amazing," noted matchmaker Bruce Trampler. The fireworks started at the end of the first round when Lyle staggers Foreman. Then in the second round Foreman turns the tide hurting Lyle against the ropes. Lyle appeared to be in deep trouble when he is saved by an early bell. The second round was only 2 minutes long. They boxed a bit more in the third although both men landed heavy punches. The explosions began in the viscious fourth round. Lyle knocked Foreman down with a hard right followed by a crushing left-right combination. George gets up immediately. Lyle moves in for the kill only to be greeted by a powering right that smashes Lyle to the canvas. Now Foreman moves in for the finish and pounds Lyle against the ropes. Desperate Lyle fights back and a tremendous left sends Foreman crashing down flat on his face. George said to himself "get up and win" refusing to be defeated. George beats the ten count and is saved by the bell. In the 5th round Foreman is badly staggered by a hard right and a left. An uppercut has Foreman seriously hurt but he comes roaring back with a series of blows that has Lyle badly weakened. Foreman softens Lyle up with a series of stiff jabs and then wails on Lyle who is back against the ropes. Lyle collapses from the onslaught of hard punches and is counted out. It was an all time slugfest that had the crowd screaming on its feet. 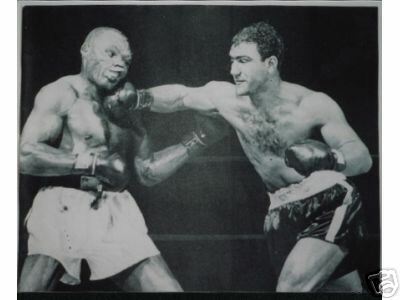 The challenger Marciano was actually the favorite to defeat the aged heavyweight champion Jersey Joe Walcott going into this fight. Walcott suprised onlookers by outboxing and outpunching Marciano and sending the younger and hungrier challenger to the canvas in the first. Marciano started coming on in the 3rd and the fight became a war of atttrition. Walcott, fighting back, regained the initiative by the 7th. Walcott won the next rounds. The 10th according to AJ Liebling, "Was the hardest fought of all." 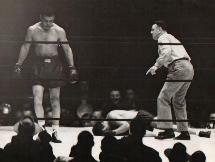 In the 11th Walcott had one of his best rounds visibly hurting Marciano with a body shot. Walcott won the 12th as well. Walcott was ahead on the scorecards and under modern rules would have retained his title by a 12 round split decision. This fight is a good case for bringing back 15 round championship fights. The title changed hands in the in fateful 13th when Marciano landed the perfect right hand punch that won the title at :43 seconds of the round. One might argue Marciano might have tried to land his right sooner but it is not certain that he would have. Walcott boxed a marvelous fight until he was caught in the 13th. Rocky Marciano became a legend thanks to "the championship rounds." 7. Joe Louis vs. Billy Conn. June 18, 1941. New York. Result: Louis KO 13. Billy Conn is a fighter who is vastly under-rated today. He was an exceptionally gifted light-heavyweight champion before he challenged the great Joe Louis for the biggest prize in sports. Conn defeated 3 former world champions by the time he was 19. Conn never lost a light-heavyweight championship fight. Bert Sugar noted that Billy was "Never fed a schedule of stiffs, Conn took them all on, beating them with his speed of foot, his agility of hand and the balls of a cat burglar." 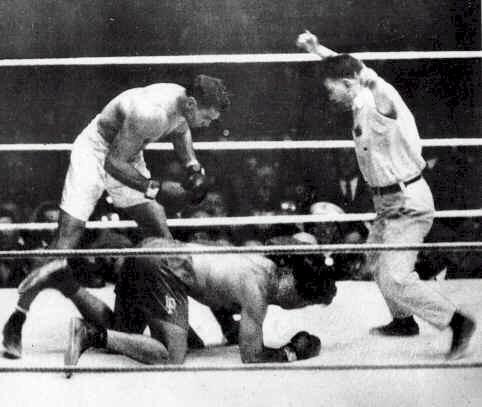 The qualities that Conn carried into the ring against Louis, according to Sugar were, "his consummate boxing skill, his flashy left hand the center piece, (that) made him a lineal descendant of Gentleman Jim Corbett, the first of the great scientific boxers" and a great defense, "Conn could block punches with his arms, elbows and gloves, and further nullify his opponent's punches by 'rolling' with them" as well as "remarkable recuperative powers, having been knocked down only twice in his career and having gotten up both times." Louis for his part had under-estimated the light-heavyweight standout. Louis said in his autobiography, "I made a mistake going into that fight. I knew Conn was kinda small and I didn’t want them to say in the papers that I beat up on some little guy so the day before the fight I did a little roadwork to break a sweat and drank as little water as possible so I could weigh in under 200 pounds. Chappie was as mad as hell. But Conn was a clever fighter, he was like a mosquito, he’d sting and move." Conn proved to be quite troublesome indeed sticking and moving and using his quick hands and feet to dart in and out and using his good classic defense to thwart Louis at every move. Joe had his moments drawing blood from Conns nose in the 3rd round with his jab, stunning Conn in the 5th with a left hook, and cutting his eye and nose. In the 8th round dehydration had set in and Louis began to tire badly. By the 12th round Louis was completely exhausted and Conn was ahead on two of the three official scorecards by two and three rounds respectively. In the 13th Conn told Louis “Joseph your in for a tough fight tonight.” Then Louis recalled that "he started that long left hook I had been waiting for. I thought “Yea your right” and they counted him out." Louis saved his championship with a crushing picturesque combination. Conn had to be helped back to his corner. When asked why he didn't try to box and stay away form Louis the last two rounds Billy replied, "What's the use of being Irish if you can't be thick?" They would meet once more. When asked how he would deal with Conn this time Joe deadpanned, "He can run but he can't hide." And so it was. 8. Jim Jeffries vs. Tom Sharkey. November 3, 1899. Coney Island, NY. Result: Jeffries W 25. Hailed by one sportswriter as “99 minutes of hell”, the scrap between Jeffries and Sharkey was one of the most brutal and grueling contests of toughness and endurance ever witnessed in the history of heavyweight boxing. Sharkey despite being at a physical disadvantage to the much larger Jeffries pressed the fight. It was a fierce struggle that made all the more difficult for the champion because he was handicapped by a left elbow that he dislocated in training a week before the fight. Jeff figured he had one good punch with that left and in the second round unleashed his best hook and dropped Sharkey to the canvas. Tom got right up and Jeff's left was useless for the rest of the fight. The early rounds belonged to Jeff but in the mid-rounds the swarming Sharkey began to come on. Sharkey was fighting his fight, setting the pace and outhitting Jeffries on the inside. By the 10th round Tom had Jeff bleeding and reeling. Then in the 11th a hard right to the temple caused Sharkey to drop to his knees. But Sharkey again got up right away and continued his work. "It was a muderous battle for the first 18 rounds" wrote one ringsider. Both men battered each other in a close quarters battle. Sharkey dominated the action in many of these rounds. Charles Mathison, a famous sportswriter and New York boxing judge, said had the fight been a 20-rounder Sharkey would have received the decision. Nevertheless Jeffries used his greater strength and weight to advantage by leaning on Sharkey in the clinches in the later rounds and landed the heavier blows. Sharkey received enough blows in rounds 19-23 to finish most fighters career. In the 22nd round a pair of viscious uppercuts had Sharkey groggy and in trouble. Tom rallied again though in the 24th and 25th rounds as Jeffries appeared to tire. Referee Siler, the lone judge of the bout, raised Jeffries arm as the winner in what was considered the greatest heavyweight fight ever until modern times. 9. Floyd Patterson vs. Ingemar Johansson 3. Mar 13th, 1961. Miami Beach, Fl. Result: Patterson KO 6. This was the rubber match in the Patterson-Ingo series. Floyd was destroyed by the Swede's "toonder and lightning" right hand punch in the first fight. Patterson became the first man in history to regain the title in the rematch with a crushing left hook that left Johannson's foot freakishly twitching as he was counted out on his back. The final fight would prove to be the best. Ingemar seemed to pick up where he left off in the first fight dropping Patterson twice in round one and looked to be on his way to a sure knockout victory. Johannson had landed both sizzling right hands over Floyd's left jab. After getting up from the second knockdown Floyd abandoned his jab and slammed home a terrific left hook that knocked down Johnannson. After that Patterson came on with a strong body attack that wore down Johnannson. In the 6th round, Johansson caught Patterson with a solid right. But the power in Ingemar's punches was gone. Patterson won the fight in the 6th round with a right hand turning the trick this time. 10. Larry Holmes vs. Ken Norton. June 9, 1978. Las Vegas. Result: Holmes W 15 (split). Near the end of the Ali era two outstanding heavyweight contenders met for the WBC heavyweight title in a great fight to determine the future of the division. The stage was set when Muhammad Ali lost his title in a match against unheralded Leon Spinks. Spinks agreed to face Ali in a lucrative rematch that fall in a fight where Ali would regain the title for the third time. In the meantime, Spinks, the new champion, was stripped by the WBC for refusing to meet their mandatory challenger Ken Norton who was awarded the title. Norton had to defend against the new number one contender one Larry Holmes. Larry was considered a sort of generic or poor mans Ali by the press and public at the time. This fight would establish that Holmes was indeed a superb fighter. Norton had gave Ali three very close fights and many believed he had deserved the decision in their last fight at Yankee Stadium two years previous. Larry used his strong jab and agile footwork to box his way to an early points lead over the more aggressive Norton. In the early stages Holmes hand speed looked like too much for Norton to deal with. Kenny rallied in the middle rounds using pressure and strong body punching to bring the fight close. After 12 rounds Larry still held a slight lead on the judges cards and most ringsiders believed him to be ahead. The final three rounds are what made this fight memorable with both men trying to prove that they deserved to be called champion. Holmes had his best round of the fight in the 13th landing frequently with strong right hands. Norton came back and had his best round in the 14th as he repeatedly landed with smashing overhand rights. The 15th round was one of the best rounds in sustained action in heavyweight history, it was all out for both fighters each landing a good share of power punches. Matchmaker Bobby Goodman said, "Talk about two guys putting everything they had into every minute of a round." It was a great round to end an exciting fight and Larry Holmes won a close but well deserved split decision.